2. Fill 4 corner anchor bags with sand or rocks – fill HALF full only. 3. Insert ends of joined poles into grommet holes or tent – raise sunshade carefully. 5. 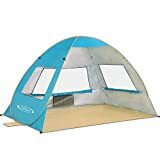 The standing tent should be facing the direction of the wind. ►Stakeless – All four corner sand anchors can be easily weighed down using rocks, sands, or any other suitable solid paraphernalia you deem fit. ►Windproof – Thanks to the new stakeless design, our well-crafted gazebo can withstand massive gusts of wind that are typical of a day out on the beach. 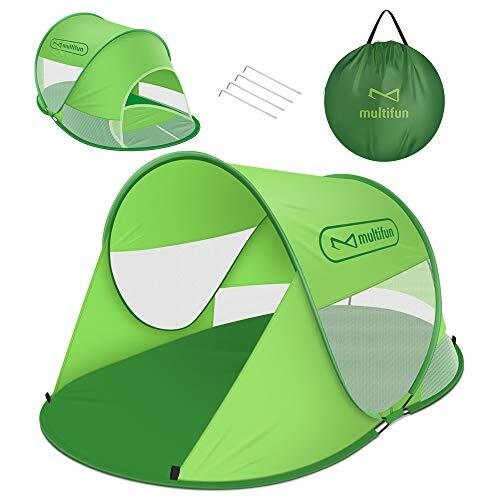 Besides, the supporting poles, which are part of the mechanical framework of the tent, are inserted into fabric thus enforcing its stability further. ►Sun Protection – A versatile UPF50+ beach tent, and you can adjust the position of the poles optionally to get the best shelter from the sun and keep enjoying the outdoors. ►Sandbag Anchors – Comes with sandbag anchors, so it is easy to set up the beach tent in a short time. And our beach tent weighs only 1.8 kg, so it is easy to take it for outdoor activities. 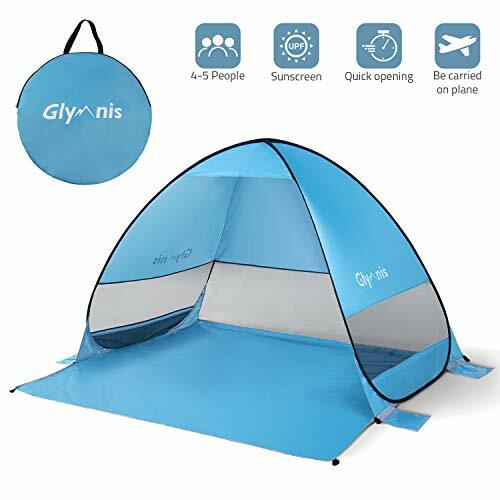 ►MULTI USE – The tent is suitable for the beach, picnics in the park, camping, the sidelines at your kids’ sports days, or the backyard.